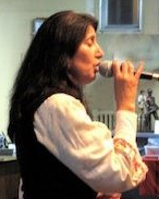 Donka Koleva (vocals) is a native of the village of Tuzha in the Stara Zagora region of Thrace. She graduated from the National School of Folk Arts in Shiroka Luka, Bulgaria, and performed for three years with the Sliven Folk Dance and Music Ensemble. She was director of the Folk Song Chorus of Sopot, has been a featured soloist on Bulgarian Radio-TV, has participated in numerous singing competitions in Bulgaria and Europe and has been featured on numerous recordings. In 1997 her recording of Javore was named "Song of the Year" in the Bulgarian national radio competition. Since immigrating to the U.S. she has taught and performed widely across N. America, both privately and at numerous camps, festivals and other events. In 2017 she and Kabilé are invited guests of honor at the week-long national Balkan-folklore camp, to be held in August in New York state. In addition to her vocal talents Donka serves as Bulgarika's manager and has organized 12 national tours for the bands Kabile', Cherven Traktor and Bulgarika, and for the Kolev Family Ensemble. 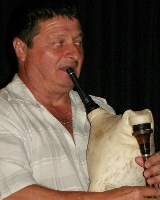 Nikolay Kolev (gadulka), a native of the Thracian Rose Valley village of Karavelovo, has been playing gadulka since age 10. After graduating from the National School of Folk Arts in Shiroka Luka, Bulgaria, he performed for three years with the Sliven Folk Dance and Music Ensemble. In 1984 he founded the orchestra "Sopot", in 1985 the wedding-music ensemble "Rozova Dolina" and in 1992 the prize-winning ensemble "Balkanski Glasove". In 1994 and 1995 the latter group took first prizes at the Varna Festival. Nikolay has accompanied many well-known singers including Vulkana Stojanova, Roumen Rodopski and Todor Kozhuharov. He has also taught many students at a number of Balkan camps in the U.S. In 1999, Nikolay was the first Bulgarian to be recognized by the Slavic Heritage Council of America for his outstanding contributions to music. In August 2017 he is expected to perform with Kabilé as an invited guest of honor at the week-long U.S. national Balkan-folklore camp. Nikolay Doktorov (kaval) is from Varna, on the coast of the Black Sea. He is a graduate of the National Music School "Filip Koutev" in Kotel, Bulgaria, and the Bulgarian National Conservatory and has performed with the world-famous Trakia Ensemble and with the Horovod Ensemble in Varna. He directs the folk music orchestra Spectar, conducts several regional folk ensembles and teaches kaval and manages the orchestra at the Strashimirov School in Varna. In 2016 he was honored by a guest performance with the Bulgarian National Radio's National Folk Orchestra. He has taught at a number of American Balkan camps and has been invited to perform with Kabilé at the 2017 U.S. national Balkan-folklore camp. 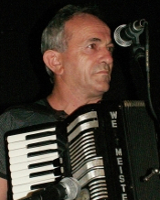 Ivan Handzhiev (vocals, accordion) is a native of the village of Lesovo, in the Yambol region of Thrace. He began singing with his mother and other village singers as a small child and started playing accordion at the age of nine. He is a graduate of the National Music School "Filip Koutev" in Kotel, Bulgaria, and the Bulgarian National Conservatory. Ivan is a master of the ornamentation and improvisation technique unique to Thrace and was a faculty member at the Koutev School for more than 25 years. He is currently on the staff of the Bulgarian National School of Dance Art in Sofia. 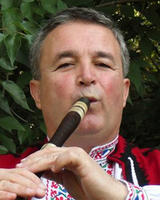 Like the other members of Kabilé, he has taught at multiple American Balkan camps and has been invited to perform with Kabilé at the 2017 U.S. national Balkan-folklore camp. Dzhenko Andreev (gaida) is from the village of Hanovo, in the Yambol region of Thrace. As a boy he studied with local teachers then went on to graduate from the National Music School "Filip Koutev" in Kotel, Bulgaria, where he developed his local style. 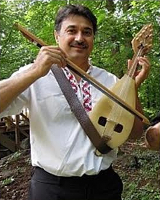 Specializing in traditional melodies from his village, Dzhenko has been a soloist with the Sliven Folk Dance and Music Ensemble for over 25 years and has performed with them throughout Bulgaria and internationally. Like the other band members, he has taught at multiple American Balkan camps and has been invited to perform with Kabilé at the 2017 U.S. national Balkan-folklore camp.